I was brought up in business with the belief that “winners never quit and quitters never win.” For years this expression haunted me and I firmly resolved that I would never quit anything no matter what it was because I was a winner. It became such an obsession to me to be true to my decision to stay the course that I found myself living a life that I wasn’t passionate about anymore and instinctively knew that it was time to move one but never did anything about it. Have you ever felt like that? 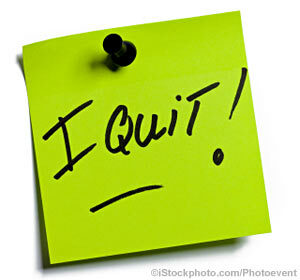 You’re stuck in a role that you used to love but don’t anymore but yet you’re sticking with it only because you don’t want to be viewed as a quitter? I’m not talking about being flakey – someone who quits anything and never really tries to succeed at anything – but am talking about someone who has put their all into their business and still feels led to move in another direction but fights making the change. Your heart breaks when you think about leaving behind years of work but deep down you know that the time has come and a new chapter of your life is ready to begin. Business School or Law School – Which is Better? Raj Singh (freelance writer, entrepreneur, and law school graduate) looks at the benefits of a law degree versus a business degree, and explains how an education in law can help entrepreneurs. He also points out some down sides to getting a law degree, like the costs, stress and time commitment. Giving back to the community and reducing impact on the environment is now a necessity for a business who wishes to engage top talent and build strong relationships with consumers and community members. Catherine Rocheleau explains how YOU can build a business “with heart” that is in alignment with your personal goals and values, as well as those of your employees. Sandra Garcia, publicist and owner of Middle Child Marketing Inc., had already been running her business for four years when she decided to take part in a mentorship program — as the mentee! She discusses how she started her business, what she learned from working with a mentor, and why she decided now was the time to do it. A New Year, New Opportunities and….Overwhelm? It’s January and the start of a new year and a revved up schedule with new demands, dreams and goals. January often rolls in like a lamb after the holidays, but quickly picks up speed and ends like a lion. Are you feeling overwhelmed? Catherine Rocheleau gives three tips to conquer an out-of-control workload. What’s Your “X” Factor? Find Out & Attract More Clients! Do you know what it takes to win in business? Is it talent? Skill? Luck? It may not be what you think! Natasha Golinsky reveals four strategies to help you figure out what your “X” Factor is so you can give your clients what THEY want and need. Catherine Rocheleau explains the 3 R’s of entrepreneurship, and gives compelling reasons why entrepreneurs must make time for relaxation. By recharging your batteries, you’ll feel refreshed and be more innovative and creative at work. Are you overwhelmed by too much email? Rigdha Acharya give three easy steps for taking charge of your inbox and using email more effectively for your business. Natasha Golinsky wonders why some leaders can motivate their team to achieve success while others can barely get their team to ‘good enough’ and she compares leadership to cooking. Are you the type of leader who takes the easy mac-and-cheese route, or do you spend the extra time and effort to create a four-star meal? Are your business practices helping or hindering the environment, your community and your employees? Catherine Rocheleau explains three facets of Business Sustainability every entrepreneur should consider incorporating into their business, with tips on how to go about doing so. “As I work with entrepreneurs, I frequently experience times when they are overwhelmed and not able to move their business forward because they don’t know what to do. Does this sound like you?” Catherine Rocheleau explains what systems are and how you can improve your business growth by having good ones in place.